Read below to get information on ordering prices, rates, costs and fees for buying or purchasing gravestones, headstones, single markers or lawn level grave markers, memorials and upright gravestones and family monuments for Chicago cemeteries or Chicago Jewish cemeteries. Example epitaphs and sayings are available for inscriptions, etchings and engravings. 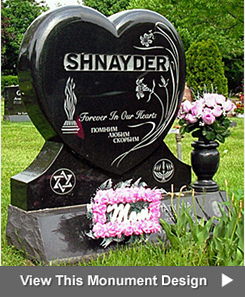 Click here for information on ordering a gravestone, headstone, grave marker, memorial or monument for a Chicago cemetery or Jewish cemetery. Below is a price guide for your reference. We make our gravestones, grave markers, monuments and headstones right here in Chicago at our production facility. Because there is no middleman we pass the savings right along to you. The granite you choose and the size of the memorial is primarily what determines the rate. When you visit our store, we will be happy to tell you specific gravestone or grave marker prices so you will know exactly how much the memorial you created will cost. The prices shown below include the memorial, standard design, three lines of lettering and delivery. Cemetery fees, where applicable, are additional. 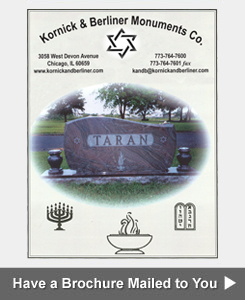 Our company is the only Jewish monument company in Illinois. We offer monuments in a wide variety of colors, prices and styles and we also offer custom engraving services. We serve families throughout the greater Chicagoland area with factory direct prices. We have several nationally recognized designers on staff and are proud of the distinctive memorials we produce in our own state of the art plant. While cemetery memorials are still our primary focus, our product offerings have grown to include commemorative plaques, commercial signage, benches, and veterans and Holocaust memorials. If you’ve never ordered a headstone before or if it’s been a long time since you’ve needed a memorial, you’ll be pleasantly surprised at how simple the process is and how rewarding it can be. Here are the steps normally followed but you’re the customer, so you’re in charge. We will work at whatever pace you are comfortable with and we will answer any questions you may have as they arise. If there will be several people involved in the decision making process, we encourage you to come in together so decisions can be made collaboratively. When you visit our Chicago showroom, a staff member will ask you who the memorial is for and what cemetery it will be placed in. Most cemeteries in the Chicagoland area have regulations regarding the types of grave markers allowed. 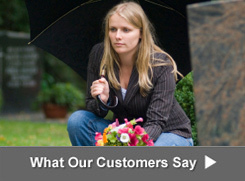 When we know the cemetery, we can show you a headstone that meets your cemetery’s requirements. Call us at 773-764-7600 to schedule a consultation at our showroom. After we explain and show you the type of memorial that is accepted by your particular cemetery, we will present you with a selection of granite colors. Granite is a beautiful material that will never deteriorate, and Kornick & Berliner has the largest inventory of granite markers and monuments in Chicagoland. In fact, if you would like to select the exact piece of stone to use for the monument you can do that as well. We’re sure we will have a color you will love. If we don’t, we’ll find it for you. Should your cemetery only allow bronze markers, we have a wide selection of sizes and designs for you to choose from, including several exclusive designs only available through the Kornick & Berliner Monument Co.
After you have decided on the color, size and style memorial we will lead you through the design discussion. It is helpful if you think about the type of design carving you would like before coming in because there are literally thousands of possibilities. Are you interested in religious ornamentation or something more secular? Did your loved one have a hobby, profession or other passion in life you would like commemorated on the headstone? Is there a specific image you want engraved on the memorial? If you bring in an object or photo that was special to the deceased we can replicate the image on the monument for a very personal tribute. Lastly we will discuss the wording to be engraved on the memorial. The engraving, or inscription, will name the person resting there, provide a historical record and tell something special about the person to everyone who passes by. Think about how you would like the person’s name to read on the headstone. We can help you compose a traditional inscription in Hebrew if you wish to use one. How about the epitaph? There is something special to say about everyone. If you need some help with ideas, visit the “Epitaphs” section of our website. Be sure to bring in the full dates of birth and death when you visit us. Sometimes these dates can be hard to remember off the top of your head. Bringing along any cemetery paperwork showing the grave location would be helpful as well. 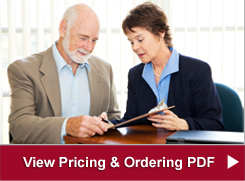 Ordering over the phone can be a very simple process. If you have found a memorial, monument or headstone on our web site or at our showroom and would like to order over the telephone, please call 773-764-7600. Credit card payments accepted are MasterCard, Discover and Visa. Kornick & Berliner Monument Company invites you to peruse our web-site at www.kornickandberliner.com. You will find a large selection of pictures of granite cemetery monuments, headstones, grave markers, gravestones, tombstones, memorial headstones, memorial benches, cemetery headstones and bronze markers. If you would like to talk with one of our sales associates about a memorial that you see on our web site, please call 773-764-7600. Our friendly staff will help you with your selection, provide you with pricing information and can take your order over the phone. Below is a price guide for your reference. We make our headstones right here in Chicagoland. Because there is no middleman we pass the savings right along to you. The granite you choose and the size of the memorial primarily what determines the price. When you visit our store, we will be happy to tell you specific grave marker and monument prices so you will know exactly how much the memorial you created will cost. The prices shown below include the memorial, standard design, three lines of lettering and delivery. There are many customization options available to you. We have designed and carved individual flat markers for over $3000 and many family upright monuments over $45,000. The prices above are meant to show you the range within most purchases usually fall. If you have a question that is not answered by the above or on the FAQ section of our website, please call our office at 773-764-7600. We are open from 9:00 AM to 5:00 PM Monday through Thursday, 9:00 AM to 4:00 PM on Friday, and 10:00 AM to 2:00 PM on Sunday. We are pleased to assist you in any way we can.